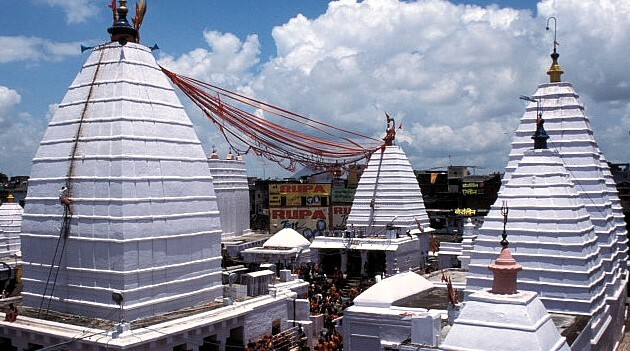 Baba baidyanath temple, also known as Baba dham and Baidyanath dham is one of the twelve Jyotirlingas, the most sacred abodes of Shiva. It is located in Deoghar in the Santhal Parganas division of the state of Jharkhand, India. It is a temple complex consisting of the main temple of Baba Baidyanath, where the Jyotirlinga is installed, and 21 other temples. According to Hindu beliefs, the demon king Ravana worshipped Shiva at the current site of the temple to get the boons that he later used to wreak havoc in the world. Ravana offered his ten heads one after the another to Shiva as a sacrifice. Pleased with this, Shiva descended to cure Ravana who was injured. As he acted as a doctor, he is referred to as Vaidhya (“doctor”). From this aspect of Shiva, the temple derives its name. The Matsyapuran narrates the place as Arogya Baidyanathitee, the holy place where Shakti lives and assists Shiva in freeing people from incurable diseases. The Madan Madhavi, a manuscript preserved in the archives of Maharaja of Gidhaur, provides information related to the political and cultural history of Gidhaur Raj. It includes a description of Babadham as well. This whole area of Deoghar was under the rule of the Kings of Gidhaur who were much attached with this temple. Raja Bir Vikram Singh founded this princely state in 1266. In 1757 after the Battle of Plassey the officers of the East India Company paid their attention to this temple. An English man, Keating was sent to look at the administration of the temple. Mr. Keating, the first English collector of Birbhum, took interest in the administration of the temple. In 1788, under Mr. Keating’s order Mr. Hesilrigg, his assistant, who was probably the first English man to visit the holy city, set out to supervise personally the collection of the pilgrim offerings and dues. Later, when Mr. Keating himself visited Babadham, he was convinced and forced to abandon his policy of direct interference. He handed over the full control of the Baba baidyanath temple to the hands of the high priest.